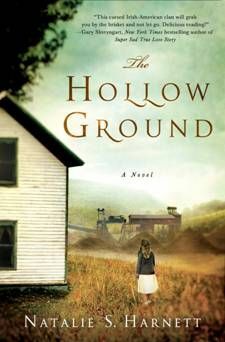 Inspired by the real-life deadly coal mine fires in now-infamous Centralia, Pennsylvania, and the equally devastated town of Carbondale, THE HOLLOW GROUND is an extraordinary debut novel with an atmospheric, voice-driven narrative and an indelible sense of place. Already being compared to A Tree Grows in Brooklyn and To Kill a Mockingbird, this evocative story about family and the nature of love between a parent and child introduces a stunning and powerful new voice in literary fiction. It’s 1961, and the ground is burning beneath eleven-year-old Brigid Howley’s feet. The underground mine fires ravaging Pennsylvania coal country have forced Brigid and her family to seek refuge with her estranged grandparents, the formidable Gram and the Black Lung stricken Gramp. Tragedy, though, is no stranger to the Howleys, a proud Irish-American clan who takes strange pleasure in the “curse” laid upon them generations earlier by a priest who ran afoul of the Molly Maguires, a secret society of Irish and Irish-American coal miners. But the weight of this legacy now rests heavily on a new generation, when Brigid, already struggling to keep her family together, makes a grisly discovery in a long-abandoned bootleg mine shaft. In the aftermath, decades’ old secrets threaten to prove just as dangerous to the Howleys as the burning, hollow ground beneath their feet. My thoughts: Brigid is the narrator of this story, set against the backdrop of the Appalachian coal mine fires of the 1960's. I had never heard of these fires and found them fascinating, devastating and unbelievable. Brigid tells how her Aunt's house, where they had been living, becomes uninhabitable as the fire nears and literally hollows out the ground beneath their feet. Her family is forced to move to a nearby town and move in with their Grandma and Grandpa. The fires are raging beneath this town as well. I liked Brigid as a narrator. She didn't sugar coat anything and she also did not feel sorry for herself or her circumstances. Her family is very dysfunctional and she if basically raising herself. As secrets continue to be revealed, including the answers to a murder mystery, what she thought she knew about her family also continues to change. I really liked this book. The background was such a stark contrast to the voice of Brigid. I read this book awhile ago and the story has really stayed with me. This was a debut book for Natalie Harnett and I look forward to seeing what else she writes in the future. About the author: NATALIE S. HARNETT is an MFA graduate of Columbia. She has been awarded an Edward Albee Fellowship, a Summer Literary Seminars Fellowship, and a Vermont Studio Center Writer’s Grant, and was a finalist for the Mary McCarthy Prize in Fiction. Harnett has been published in The New York Times, The Madison Review and The MacGuffin. She lives on Long Island with her husband and toddler. I liked this book but found it slow at times. Of course, I had a lot going on at the time, so it could have been me. This was on of my picks for Books That Caught Our Eye, and I can't wait to read it! I hadn't heard of this book until now. It looks fairly interesting. I haven't heard of these fires until now either :P Ooh I am feeling ignorant xD But it seems like it could be interesting, and Brdigit sounds like a strong girl.